(Nanowerk News) Analysis of the protein structure of the 'motor' of motile bacteria at high resolution by Saori Maki-Yonekura and Koji Yonekura of the RIKEN SPring-8 Center, Harima, and Keiichi Namba of Osaka University has revealed the mechanism for transitioning between different movements. The flagellum has a rotary motor embedded in the cell membrane and a propeller-like filament connected to the motor by a universal joint. "It's a tiny machine, but amazingly well designed for its function," says Yonekura. When moving along chemical or temperature gradients, bacteria alternate between 'running' and 'tumbling'. Switching between these swimming patterns involves a reversal in motor rotation every few seconds. Although the complete flagellum has many proteins, the flagellar filament is composed solely of the protein flagellin. The amino-acid sequence of flagellin is conserved among bacterial species, as is its structure. 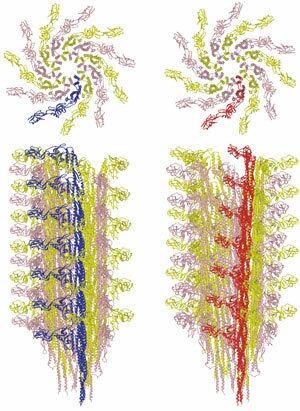 Figure 1: Transition between the L-type (left) and R-type flagellar filaments (right). The upper panels show the distal end view. The lower panels show the side view. One of the 11 protofilaments is colored blue for the L-type and red for the R-type. In most species of bacteria the flagellar filament is formed of 11 'protofilaments', the flagellin subunits of which are arranged to form nearly straight 'supercoiled' helical arrays. Motor reversal switches the structure between left-handed and right-handed conformations, involving different combinations 'L-type' and 'R-type' filaments. Biologists usually study protein structure using x-ray crystallography. But flagellin forms filaments that prevent crystallization. Cryo-electron microscopy (cryo-EM) can be used, but the resolution is usually not high enough to see atomic details, because electron irradiation severely damages biological samples. "We developed techniques to analyze the structure at high resolution using cryo-EM," explains Yonekura. The researchers previously derived the structure of the R-type flagellar filament of Salmonella enterica, the bacterium responsible for many cases of human food poisoning ("Complete atomic model of the bacterial flagellar filament by electron cryomicroscopy"). Their latest analysis has revealed the structure of the L-type filament using cryo-EM ("Conformational change of flagellin for polymorphic supercoiling of the flagellar filament"). In the running mode of swimming, the flagellar motor rotates counter clockwise as viewed from outside the cell, and several flagellar filaments in the left-handed helical shape form a bundle that propels the bacterium forwards from behind. On motor reversal, twisting causes these filaments to transform into the right-handed shape and to disengage from the bundle, causing the cells to tumble and change direction. By comparing the structures of the L- and R-type filaments (Fig. 1), the researchers found flexible changes in the conformation of flagellin within the filament. "The flagellar filament must be flexible enough for morphological transitions needed to change swimming direction, but strong enough to withstand high-speed rotation of the motor," explains Yonekura. The researchers hope that their research will help in the development of new drugs against pathogenic bacteria, and eventually lead to an artificial nano-screw.